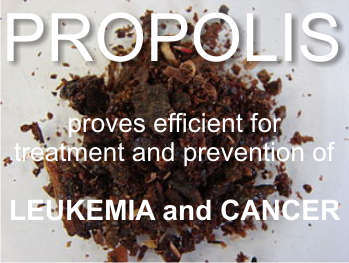 Propolis proved to be able to prevent and treat leukemia and cancer. This is not another folk claim, it’s what the studies tell us. Propolis is a bee-metabolized resinous substance (bee glue) from plant sap and gums. The bees use propolis to fill spaces and to coat walls of the hive for protection. And though is has been in usage as a healing agent since antiquity, yet it gained popularity as a health promoter and is highly regarded for its medicinal properties, only in Eastern Europe, South America, and Asia. Lots of studies have already validated its biological effects, which range from antimicrobial, antioxidant, anti-inflammatory, antidiabetic, dermatoprotective, anti-allergic, laxative and immunomodulatory to anticancer. 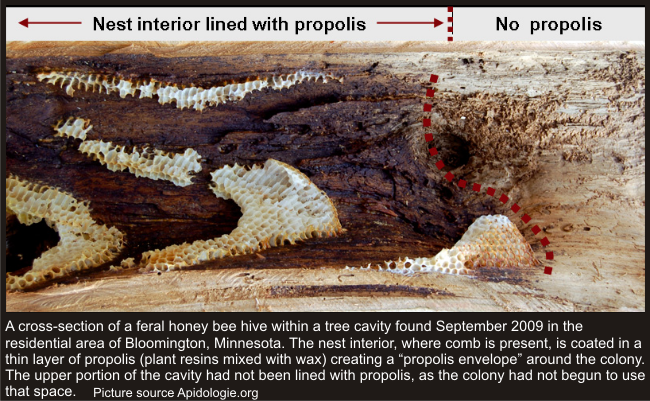 Propolis is that dark “paint” that covers the wood. • Propolis can be used in adjuvant therapy for cancer. On February 27, 2015, The Journal of Dietary Supplements published the review “Emerging Adjuvant Therapy for Cancer: Propolis and its Constituents.” by Dr. Seema Patel, Bioinformatics and Medical Informatics Research Center, San Diego State University, USA. This review documents the recent advances and scope of amendment in cancer remediation with adequate emphasis on the mechanistic aspect of propolis. The study underlines propolis’ efficacy against brain, head and neck, skin, breast, liver, pancreas, kidney, bladder, prostate, colon and blood cancers. Caffeic acid, phenethyl ester, chrysin, artepillin C, nemorosone, galangin, cardanol and many others have been identified as the components conferring antitumor potentials. Dr. Seema Patel concludes that despite phenomenal development in cancer research, conventional therapy falls short in complete malignancy management. Which is why the results obtained so far build hope that propolis as a complementary medicine may address the lacunae. • How should we take propolis? On 19 March 2014, Hindawi Publishing Corporation was published the review “Polyphenols as Key Players for the Antileukemic Effects of Propolis”, by Murtala B. Abubakar et al. Crude form of propolis and its phenolic contents have both been reported to exhibit antileukemic effects in various leukemia cell lines. The ability of the polyphenols found in propolis to arrest cell cycle and induce apoptosis and differentiation, in addition to inhibition of cell growth and proliferation, makes them promising antileukaemic agents, and hence, they are believed to be a key to the antileukaemic effects of propolis in different types of leukaemia. The article reviews the molecular bases of antileukaemic activity of both crude propolis and individual polyphenols on various leukaemia cell lines, and it indicates that propolis has the potential to be used in both treatment and prevention of leukaemia. This however needs further evaluation by in vitro, in vivo, and epidemiological studies as well as clinical trials. Brazilian propolis, also called red propolis, has been the subject of the study Inhibitory Effect of Propolis on the Growth of Human Leukemia U937, by Keiko Aso et al, who found that crude propolis exhibited a dose and time-dependent inhibitory effect on the growth, as well as synthesis of DNA, RNA, and protein in these cells. The study was made using a Brasilian propolis preparation, on U937 human histiocytic lymphoma cells. The scientists found that propolis strongly inhibited the growth of the cells and macromolecular synthesis in a dose- and time-dependent manner by apoptosis. “Propolis at 0.015—0.5 μl/ml showed antitumor activity with an IC50 of 0.18 μl/ml for 3 d. It also inhibits DNA, RNA and protein synthesis with an IC50 of 0.08, 0.17 and 4.3 μl/ml, respectively. The inhibitory effect on DNA synthesis was partially irreversible. Moreover, an apoptotic DNA ladder and chromatin condensation were observed in the same concentration range in which cell growth was inhibited. The caspase inhibitor, Z-Asp-CH2-DCB, prevented DNA fragmentation. These results suggest that the antitumor activity of propolis occurs through the induction of apoptosis.” Their conclusion? Another Brazilian propolis extracted with water or ethanol was found to inhibit cell growth which was thought to be as a result of direct cytotoxic effect of propolis and induction of granulocytic differentiation in the HL-60 cells. The results are published in the article Effects of propolis on cell growth and gene expression in HL-60 cells, by Satoshi Mishima, Japan. Turkish propolis, or Manisa propolis. The study Evaluation of Manisa propolis effect on leukemia cell line by telomerase activity, by Gunduz et al, also demonstrated the mechanism of propolis-induced apoptosis. They demonstrated the inhibitory effect of ethanolic extract of Manisa (Turkish) propolis on telomerase activity in T-cell lymphoblastic leukemia (CCFR-CEM) cell line by determining the ratio of human telomerase reverse transcriptase (a catalytic subunit of telomerase associated with telomerase activity) which they found to be decreased from 195.56 to 13.29 after treatment of the cell with propolis; they therefore suggested that one of the mechanisms involved in propolis-induced apoptosis may be related to inhibition of telomerase activity. Korean propolis has also been studied by Hyeon Soo Eom et al. Most of the above findings were confirmed by the study Propolis inhibits the proliferation of human leukaemia HL-60 cells by inducing apoptosis through the mitochondrial pathway (published on may 2010), which aimed to investigate the effect of propolis on the proliferation of human leukaemia HL-60 cells and whether propolis might induce apoptosis in HL-60 cells. “The results showed dose- and time-dependent decreases in the proliferation of HL-60 cells treated with propolis (above 3 µg mL−1 of propolis). Further studies revealed that the anti-proliferative effects of propolis were caused by inducing apoptosis. Agarose electrophoresis of genomic DNA of HL-60 cells treated with propolis showed the ladder pattern typical for apoptotic cells. Propolis induced the activation of caspase-3 and cleavage of poly (ADP-ribose) polymerase in HL-60 cells. Propolis also induced the release of cytochrome cfrom mitochondria to cytosol. Extracts from both red and green propolis proved to be cytotoxic to all the tested cells, with the red propolis being more effective compared with the green propolis. • Chrysin, a flavonoid found in propolis protects against oxidative damage related disease, caused by Methylmercury. On February 2015, the study Protective Effects of the Flavonoid Chrysin against Methylmercury-Induced Genotoxicity and Alterations of Antioxidant Status, In Vivo, by Eduardo Scandinari Manzolli et al, from the University of São Paulo, Brazil, showed that flavonoids found in Propolis and honey have Protective Effect Against Oxidative Damage. Flavonoids are the main component of honey or propolis which offer them the antioxidant properties. Any disease related to oxidative damage, can be prevented with these inexpensive solutions. Chrysin – is the name of one of dietary flavonoids is chrysin, found mainly in passion fruit, honey, and propolis. Methylmercury (MeHg) is a toxic metal whose main toxic mechanism is oxidative damage. The study aimed to evaluate the antioxidant effects of chrysin against oxidative damage, induced by MeHg in Wistar rats. Animals were treated with MeHg (30 µg/kg/bw) in presence and absence of CR (0.10, 1.0, and 10 mg/kg/bw) by gavage for 45 days. Glutathione (GSH) in blood was quantified spectrophotometrically and for monitoring of DNA damage, comet assay was used in leukocytes and hepatocytes. MeHg led to a significant increase in the formation of comets; when the animals were exposed to the metal in the presence of CR, higher concentrations of CR showed protective effects. Moreover, exposure to MeHg decreased the levels of GSH and GSH levels were restored in the animals that received CR plus MeHg. The results of the study indicated that consumption of flavonoids such as Chrysin may protect humans against the adverse health effects caused by Methylmercury. Is honey a natural treatment to cancer? And I thank you for your appreciation. It means a lot. I will always try to offer good, quality info for my readers. Also, thank you for letting people know that nigella sativa really does a very good job when cancer or HIV are the concern. And not only. As for the Modern Medicine, things will change. Considering that, for example, in 1970s it was thought that our food had nothing to do with our health, and the scientists thought that only chemical medicine could cure us, now, in 2016, we only have to deal with the greed of the Big Pharma, because they already know how useful plants, food, emotions (actually everything in our nature) are to us all.